This week, the Lower Juniors have been writing their own Earth poems, encouraging people to join in and help protect our planet! 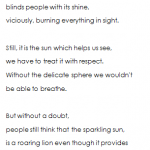 On Friday, Team Hazel started publishing their poetry. 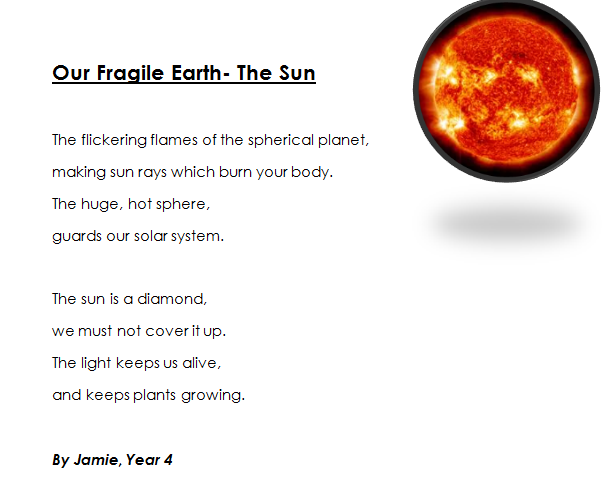 Jamie and Grace wrote poems about the Sun, using figurative language and careful vocabulary choices. 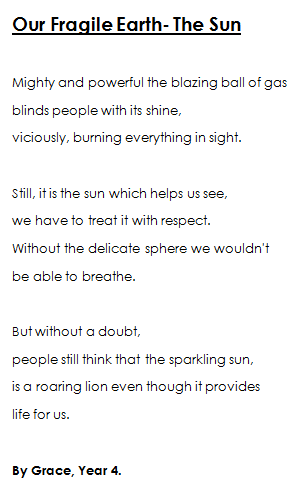 Have a read and if you are feeling inspired, you could write your own poem about saving the planet! I would love to hear them. This entry was posted in Latest News, Lower Juniors, Uncategorized, Whole School. Bookmark the permalink. Well done Jamie & Grace, great poems! 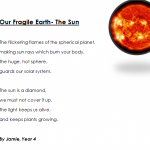 The Upper Juniors have also been writing poems recently. Sophie C on Upper Junior Baking! Making Greek Biscuits. Olivia B. on Upper Junior Baking! Making Greek Biscuits.